An art quilt wall hanging based solely on color transition. I named this piece "Fire" as it is reminiscent of the color of fire. 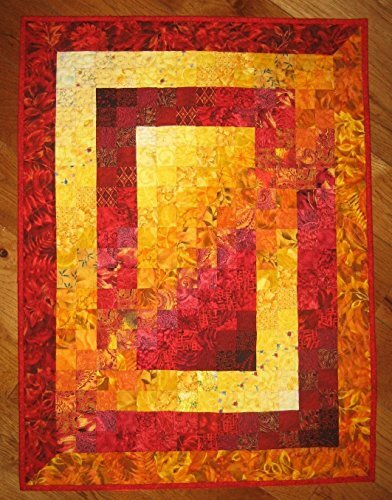 Using 2" squares, I transitioned the piece from yellow to orange to red, the progression on the color wheel to get to red. Each square is a different darker - or lighter - shade to get the color right. The orange color shoots through the middle of the piece diagonally. This is my favorite piece from an artistic standpoint. I have used this art quilt on some of my marketing materials as it is such a powerful image. Small rings are sewn to the top back for hanging. This image is sure to create a powerful statement on any wall in your home or office. I use USPS for all shipments. Shipping charges include insurance. Made in the USA. Handmade by me! Happy customer feedback: "A true work of art. It brightens each day in a frigid Vermont winter. The colors are almost effervescent, truly superb. " "Absolutely gorgeous! Beautifully composed and quilted. Love it! " Original Fluid Acrylic Abstract on Stretched Canvas-18" x 24"-"Crossing the Line"